These are all mountain getaways where you can bag a peak, traverse a ridge and end the day in the lap of luxury. 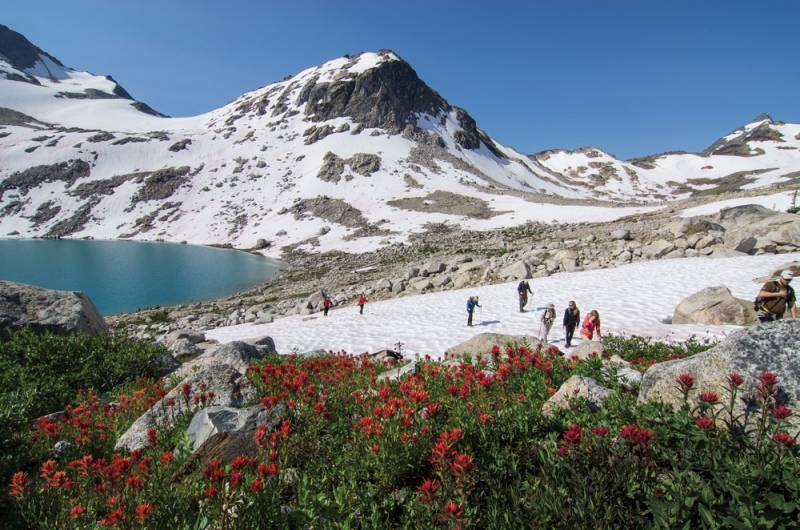 Guests of CMH Bugaboos exploring heli-accessed terrain in B.C. 's Purcell Mountains. Photograph by Lyle Grisedale, CMH Bugaboos. Low-lying clouds seem to have swallowed up the backcountry, obscuring my view of the famous Bugaboos Spires, a collection of pointy peaks that are part of the Purcell Mountains in southeastern British Columbia. The temperature is cool for mid-July, and though nature remains stunning – the overcast sky makes colours pop, from the orange and lime-green lichen atop the boulders to the pink stripes of algae that streak the snow – a chill settles in as my tired legs descend a steep hillside. And then I see it. On the far side of an alpine lake, a white Bell helicopter awaits our group of 12 hikers to spirit us back to Canadian Mountain Holidays (CMH) Bugaboos Lodge. We clamber aboard gratefully and moments later the whirly bird lands on the lodge’s heli-pad. Ten minutes after that I’m warming up in a rooftop hot tub, and rehydrating with a cold Kolsch. The clouds lift and I’m rewarded with a view of the granite towers we couldn’t see during the afternoon excursion. I could get used to this kind of aprs-hike pampering. Indeed, experiencing Canada’s mountain wilderness need not mean trekking for days and roughing it inside a cold tent after dining on Mr. Noodles. It’s possible to hike right from a well-appointed lodge, or even helicopter up to challenging trails and postcard vistas, and then feast like royalty at a modern-day backcountry castle. Here are three lodges that, together with the terrain they abut, elevate the high-country experience. 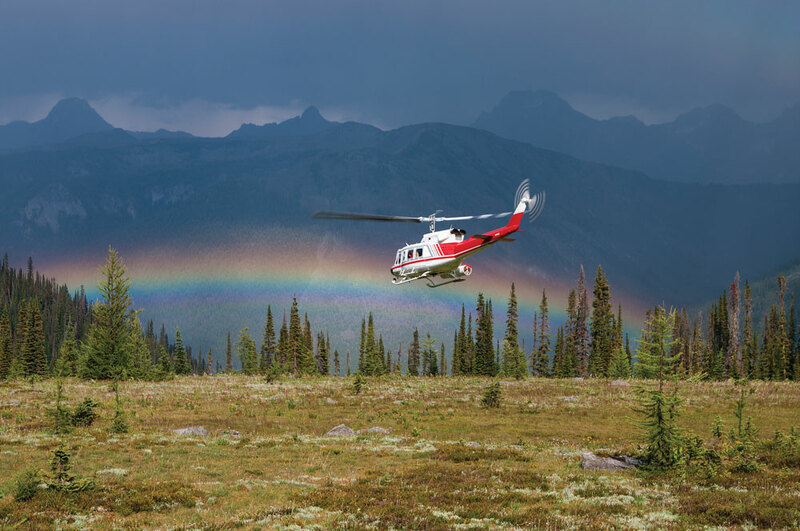 Elevation is the name of the game with heli-hiking, where a helicopter transports guests up to remote locations that would be arduous to reach on foot. So it goes at CMH Bugaboos. From the drop-off, a guide leads the group to emerald-green alpine tarns, or over loose moraine to the icy toe of a glacier. In every direction, the namesake Bugaboos Spires form a jagged skyline. The spectacular scenery makes every hike and flight epic – from the air, you see hectares of green forest, verdant valleys oxbowed with creeks and steely blue lakes. But, if we’re being honest, heli-hiking is also about what happens after the boots come off. CMH Bugaboos lodge is a welcoming retreat with comfortable rooms, common areas packed with cushy couches and wood-burning fireplaces, and an intimate bar with the best view in the Purcells. You can unwind at the spa or read in a quiet nook. Then, get social with guests from around the world over afternoon “tea goody” (a snack of cheeses, fruit and baked yummies), or during dinner, a family-style affair where you chow down on health-conscious options such as ginger salmon on a bed of broccolini. The staff is happy to accommodate special requests, such as a craft cocktail. With that level of food and service, it’s mighty tempting to “miss” the chopper ride back to civilization. (Left) CMH Bugaboos lodge. (Right) The bar at CMH Bugaboos. 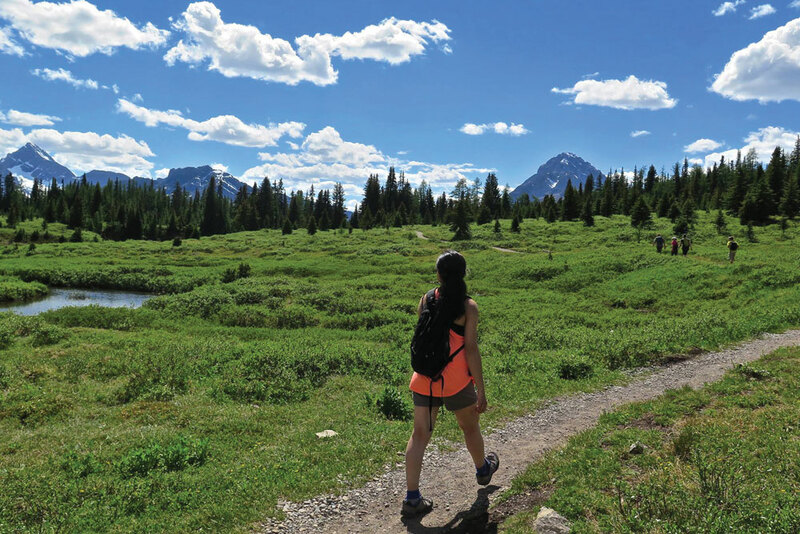 Guests at Mount Engadine can hike right from the lodge. My husband and I had just scrambled up above the tree line on the Tent Ridge trail in Spray Valley Provincial Park, when we encountered a fellow hiker. “Did you see the bear?” he asked. We had to admit we were oblivious to the bruin lumbering in front of us – too busy ogling the jagged teeth of the front-country Canadian Rockies and, later, the view back down toward Spray Lakes Reservoir, a glassy mirror reflecting cloud and peak in the morning light. We never saw the beast disappear into the forest. 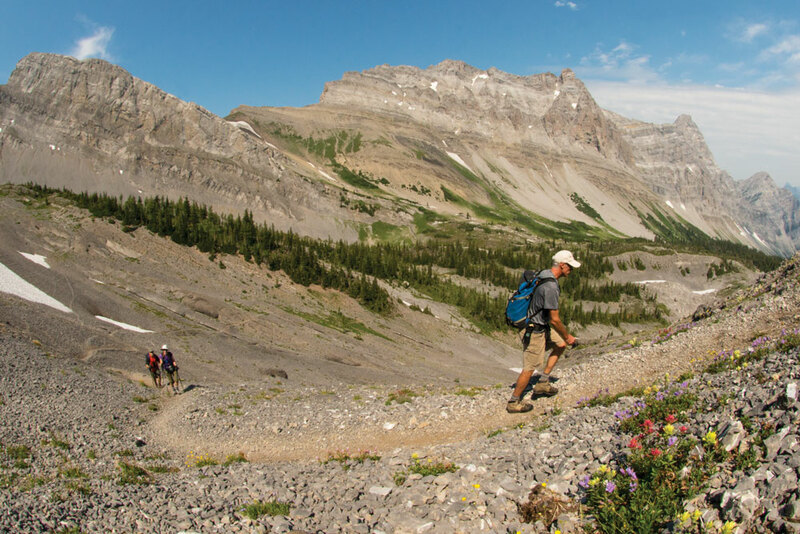 The loop trail, an 11-kilometre stunner that spends half its length high on an exposed ridge that horseshoes around a deep cirque, is easily accessible from Mount Engadine Lodge. The boutique property, set above a pretty meadow cut with a meandering stream and framed by a trio of limestone peaks, is located just off the Smith Dorien Trail about an hour from Canmore. Engadine’s rooms are cute and cozy, the food is delicious (all meals are included in the room price) and it’s close to some of the region’s best hikes, including Chester Lake and Buller Pass. As the lodge’s reputation has grown, it has become a popular base for hikers who like to bookend a day outdoors with fantastic fare. Start the day with rich coffee and eggs Benedict. Out on the trail, unpack a bag lunch of pulled pork sandwiches and homemade cookies (best enjoyed while your feet dangle off a cliff ledge, perhaps), and return to Engadine for afternoon tea taken from Adirondack chairs on the sunny patio. A few hours later, you’ll sit down to a family-style dinner of globally influenced dishes such as peach gazpacho and duck with coconut rice. Then, sated and exhausted, retire to your mountain-view room and zonk out in the inviting king-size bed. 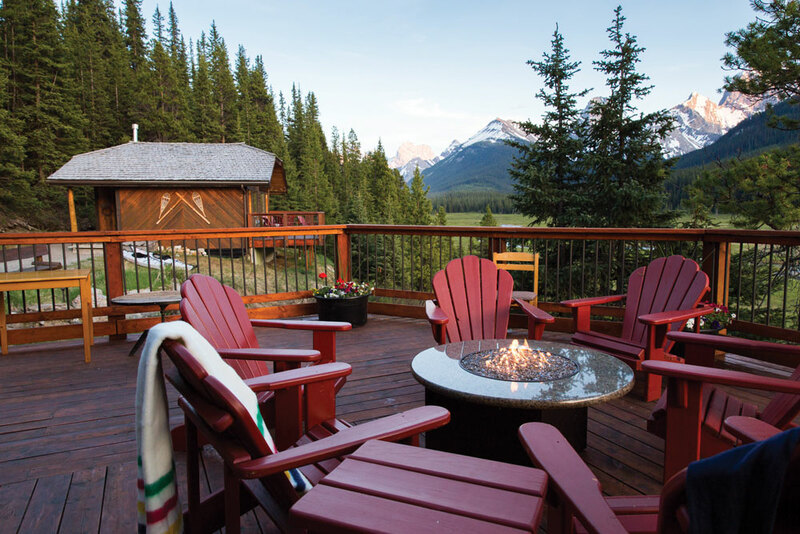 The outdoor patio at Mount Engadine Lodge. You wouldn’t go so far as to say that the best part of hiking Heiko’s Trail is happy hour at trail’s end on the patio at Island Lake Lodge. But, when you’re trekking more than 20 km and crossing three mountain passes in the heart of bear country – in one day – a backcountry explorer occasionally needs the promise of a liquid reward to get through those last few clicks. That probably wasn’t the trail-builder’s intent when he set out to pioneer the hike near Fernie, B.C. in the summer of 2000. Instead, Heiko Socher chose the path because it passes through some of the most diverse backcountry in the Canadian Rockies. Intrepid hikers gain a total of 1,200 metres elevation as they ascend through a rainforest, explore a cave, cross a deep canyon and traipse through alpine meadows blooming with wildflowers. You can even hire one of Island Lake Lodge’s Association of Canadian Mountain Guides-certified guides to cheer you onward. Where the path ends, luxury begins. 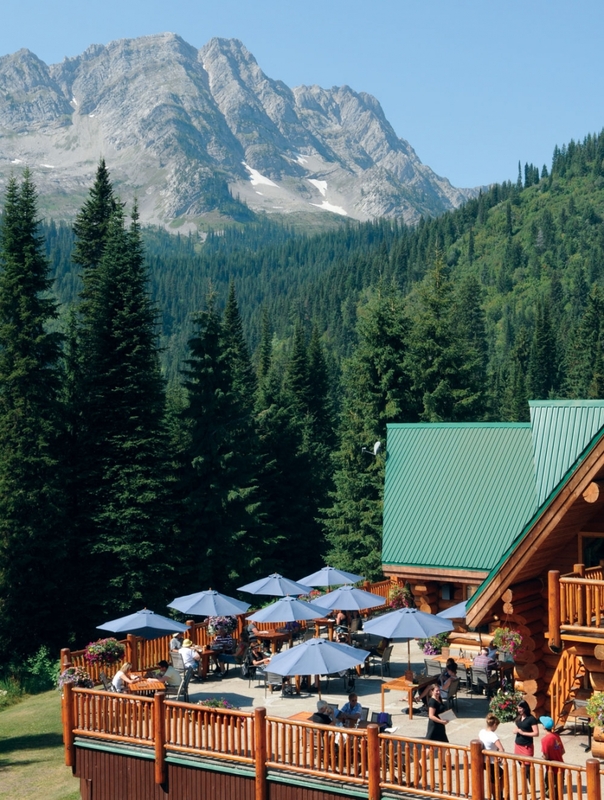 More than a few weary hikers seek rejuvenation on the Bear Lodge patio with a local beer from the Fernie Brewing Company, or stay overnight, slumbering under a feather duvet in one of Island Lake Lodge‘s log-walled rooms. In between happy hour and bedtime there’s the outdoor hot tub with views of the imposing Lizard Range and dinner inside the woodsy Tamarack Dining Room. There, executive chef Keith Farkas wows gentrified taste buds with delights such as house-made chorizo and Ocean Wise seafood dishes. The overall experience is so good you just might hike Heiko’s again for an encore.